Home » Coast to coast » Baltimore events focus on Black women and girls’ lives matter! 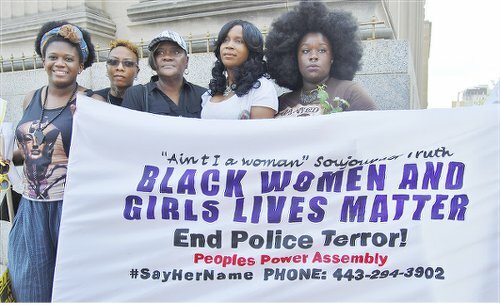 Baltimore — On the weekend of June 20-21, a group of primarily Black women, many from the Baltimore People’s Power Assembly and their allies, held a weekend of protests for all the Black women and girl victims of police brutality and racist terror. Led by a group of women of color, protesters gathered on June 20 in the neighborhood of Mount Vernon, a famous lesbian, gay, bisexual, transgender and queer neighborhood located in downtown Baltimore and across from where many homeless women receive services. There, in what was named “Rekia’s Rally” after the unarmed Black woman Rekia Boyd, who was killed by an off-duty police officer in 2012, protesters spoke out against the silencing of the narratives surrounding Black women and girls and their own struggles against racist police violence. Among the speakers in Mount Vernon was Tawanda Jones, a local independent activist against police brutality. Jones became active against police brutality after the murder of her brother by Baltimore city police in the summer of 2013. She spoke of both her brother’s story and her own of standing up to police brutality and harassment. A young trans woman who had been friends with Mya Hall — a Black trans woman shot dead earlier this year outside Fort Meade near Baltimore — spoke on the issue facing the trans community in Baltimore city and beyond. Protesters marched from Mount Vernon into West Baltimore, where they stopped at a prominent statue of the famous African-American jazz singer Billie Holiday. Poetry was recited and songs sung that described the struggle of Black women and girls. From there, the march continued to the corner of Pennsylvania and North avenues, a site of major resistance during the Baltimore Rebellion. A speakout was held where community members were encouraged to tell their own stories of police brutality. A woman from the 1199 SEIU union spoke on the recent Juneteenth holiday — held every June 19 — which celebrates the liberation of African-American people from the chains of chattel slavery. She spoke also on the need for organized labor and community groups to join the fight against police brutality and racism. The group concluded the march in the Charles Village neighborhood of Baltimore with a celebratory gathering dubbed Natasha’s Jubilee, after Natasha McKenna, who was murdered by police in Virginia. There was music and crafts and the group Food Not Bombs gave free food to protesters and community members from the streets. The weekend concluded with a solidarity event through spirituality, intended as a healing opportunity for the women and girl victims of racist violence. Food was distributed, professional massages given, and guided meditation and free yoga instruction were all provided. Through all these diverse approaches to highlighting the issue of Black women and girl victims, the organizers hope to create a more diverse space within the Black Lives Matter movement to take up the cause of freedom for all people of color, including Black women and LGBTQ people.